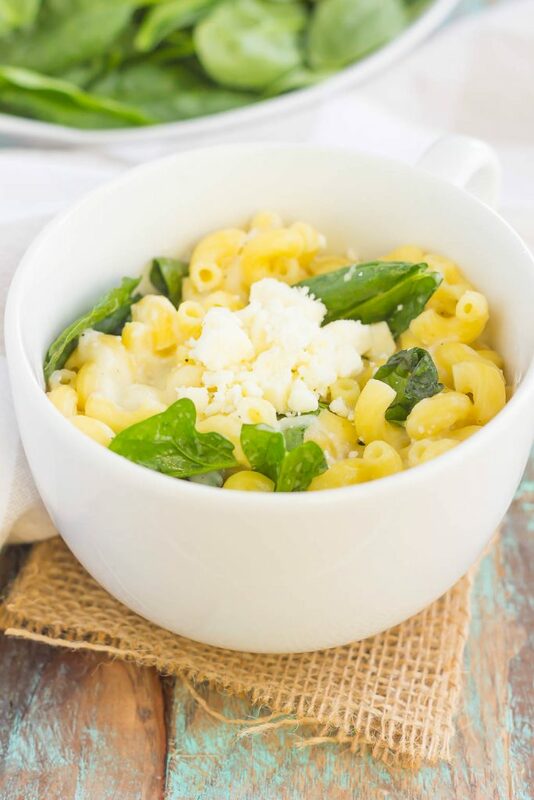 All it takes is just one mug and 5 minutes to make this Microwave Mug Spinach and Feta Macaroni and Cheese. 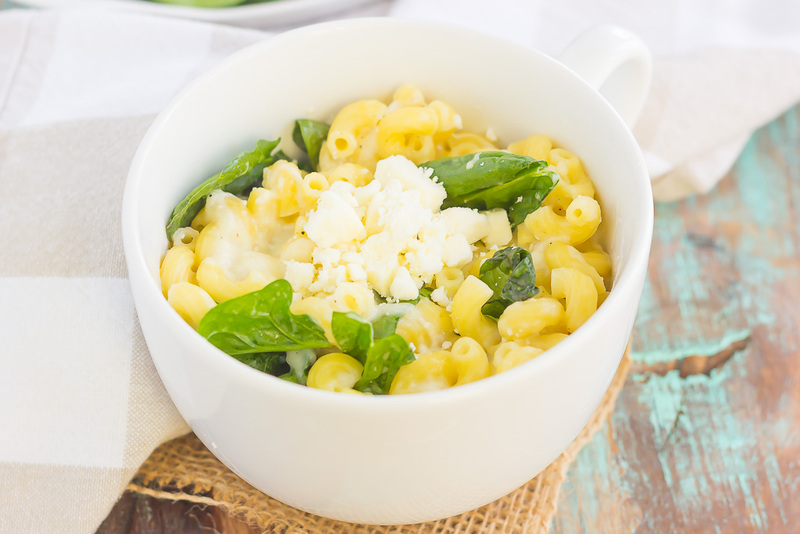 Tender pasta, mozzarella and feta cheeses and a sprinkling of spinach create an easy, cheesy, and oh-so delicious single serving recipe for the best macaroni and cheese! I’ve got another Meal for One recipe to share and I couldn’t be more excited about it! I mean, our day is starting out with cheesy carbs. How about that for a Thursday? Now, before I get into the specifics of this dish, let me throw a question out there. Do you use your microwave a lot? Silly question, but for me, it’s a necessity. I use my microwave all the time. All the time! I really don’t think I could live without it. Besides the obvious use of reheating leftovers or frozen dinners, I often use my microwave to melt butter and chocolate, to heat up soup, water for tea or hot chocolate, or even to make scrambled eggs for one. I’m just too lazy when it comes to turning on the stove for that. Plus, using the microwave usually means there are less dishes to clean, and that’s always a winner in my book! And if you remember this Strawberry Banana Baked Oatmeal in a Mug that I shared with you last month, you can see why using the microwave to whip up tasty dishes can be so easy, fun and delicious! And today, I’ve got another winner for you! If you’ve never made mac ‘n cheese in the microwave before, then you’re in for a real (and cheesy!) treat. 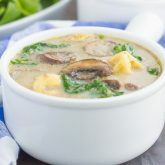 You can skip the stove top method with the boxed mixes, because this easy mug version is all you need for a creamy and cheesy dish. And when I say it’s creamy and oh-so cheesy, I mean it. 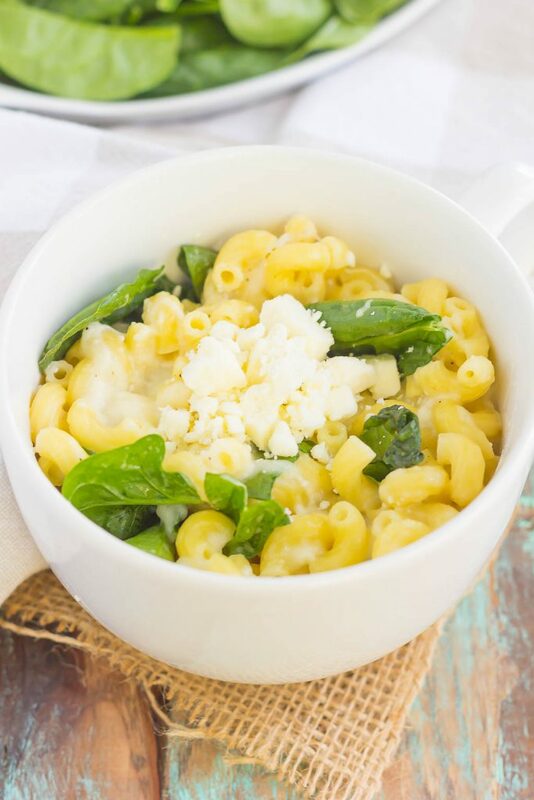 This Microwave Mug Spinach and Feta Macaroni and Cheese is made with just six ingredients, ready in about 5 minutes, and loaded with two types of cheese. Plus, lots of baby spinach for a fresh spin! It also makes the perfect Meal for One recipe because it makes just the right amount. With no dishes to dirty (besides a mug and measuring utensils), this fast, fresh, and easy dish is sure to have you coming back for more. Simply add the noodles and water to a microwavable mug or bowl and cook until tender. One the noodles are done, add a touch of milk, the cheeses, spinach, salt and pepper, and stir to combine. See? I told you this was easy! One bite and you’ll be hooked on the tender pasta, creamy cheese sauce and fresh spinach. Easy to make and even better to eat, you’ll love this simple meal that’s perfect for just one serving! 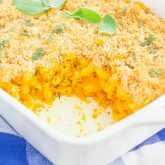 Looking for more Meal for One recipes? I’ve got you covered! Add noodles and water to a large microwaveable mug or bowl. Be sure mug is oversized, as water will boil over. Place mug onto a plate or larger bowl (to catch the water that boils over) and microwave for 2 minutes; stir, and then continue to microwave for 1-2 more minutes, or until noodles are tender. Pour remaining water from mug. Add milk, mozzarella cheese and feta cheese. Stir to combine. Add more milk, if needed, for a creamier texture. Add baby spinach, salt and pepper, and stir. This recipe is specifically tested as an individual serving meal. However, if you're cooking for a family of two (or more), double (or quadruple, etc.) the ingredient amounts and this will work for you, too! Ok phew! I'm glad you don't think it's silly because I feel like I use my microwave more than most people do! :) And YES to popcorn in the microwave! Thanks for the sweet comment and pin, Cheyanne! I use my microwave all the time! Mostly for melting things like coconut oil or nut butters when they're being stubborn, but also for heating up veggie burgers (who has time to bake them in the oven, seriously?) or for leftovers, of course. As long as we're being super careful about not microwaving anything in plastic (BPA! ), I'm so down with relying on my microwave a little. 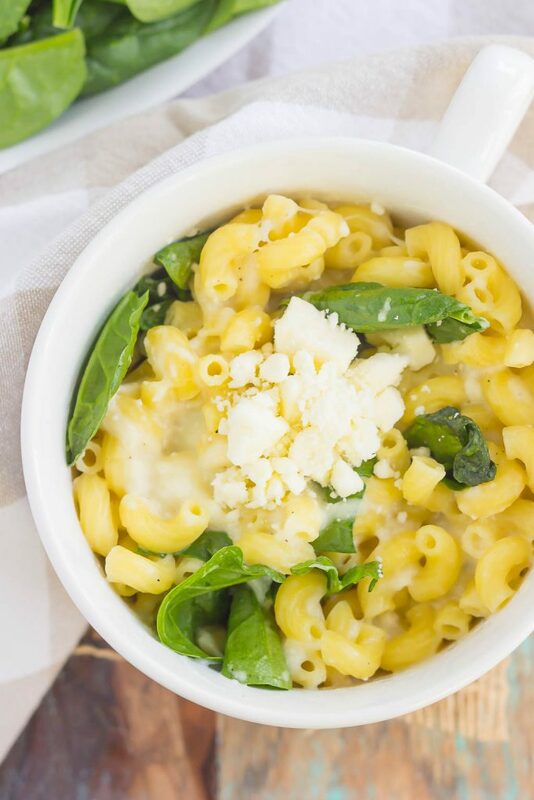 This mac and cheese is comfort food in a cup- love the spinach and feta you added. I am such a sucker for mac and cheese- had it for dinner last night! Glad you share my love of microwaves, Medha! :) Thanks for the mac 'n cheese love! Of course I use my microwave :) !! Like you - for butter, chocolate, reheating leftover and popcorn. This mug meal is actually too good to be true, Gayle! What a freakin' genius idea, Gayle! Plus, you've added spinach so now it's healthy ;) That's my story...hehehe. Let's forget about all that delicious cheese - YUMMMM! Pinning! Have a wonderful weekend, my friend! I know people use their microwave, I just think that some people don't use it as much as I do! :) But glad you're onboard! Thanks, Dawn! One mug and five minutes?! Too good to be true! I love how bright and yummy this looks! The addition of spinach is a great idea! Pinned! It doesn't get much better than cheesy carbs! 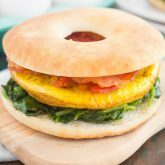 I want this for lunch! Feta in mac sounds amazing!!! How have I not tried this?!?? Great idea Gayle! Thanks, Lindsay! It's so good for a quick meal! You're a mac & cheese genius Gayle! I would've never thought to do this but I'm so trying it. Now I can have mac & cheese any time I want it for lunch and it's not the boxed kind. lol I'm in love with this recipe! Thanks, Marcie! It's so easy and way better than the boxed kind! Love this! I have been meaning to make a single-serve mac and cheese recipe for years, but I haven't gotten around to it. 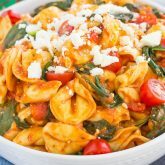 This grown up version is perfect with the feta and spinach. So much flavor!!! Thanks, Blair! It definitely is a fun, grown-up version! I use my microwave all the time. Now I have something else I can use it to make. This one serving mac 'n cheese is genius! Thanks for the sweet comment, Rachelle! 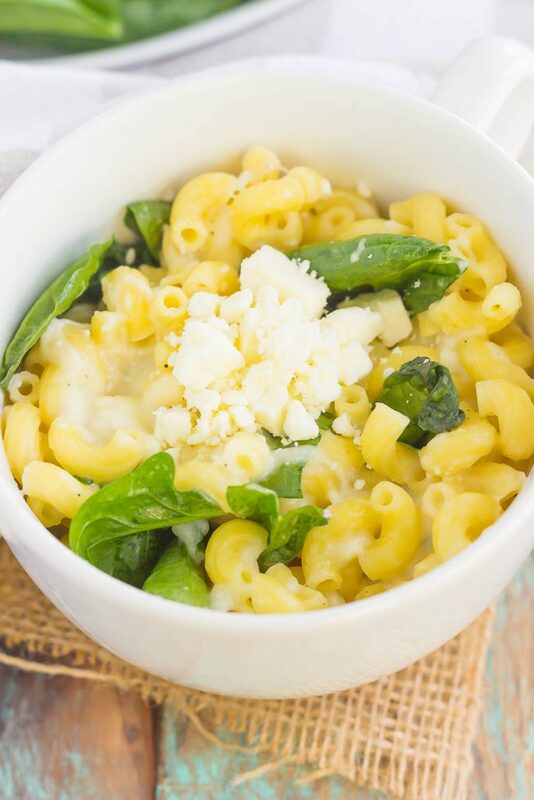 You just could never go wrong with feta and spinach hanging out in ONE-serving mac 'n' cheese! This looks way too good, Gayle and I love that I don't have to share it with anyone! Thanks for the mac 'n cheese love, Sarah! I could totally go for this mac n' cheese! Looks great. I use our microwave a lot for oatmeal. It's just the easiest way to fix oatmeal. And I have a recipe for tetrazzini made in the microwave that is delicious! I love microwave meals and this recipe is just perfect. Not to mention it's good for single person only. This means I no longer have to worry about leftovers. Plus, this really looks good. One can never go wrong with feta and spinach. Thanks for the kind words and for stopping by, Sheila!